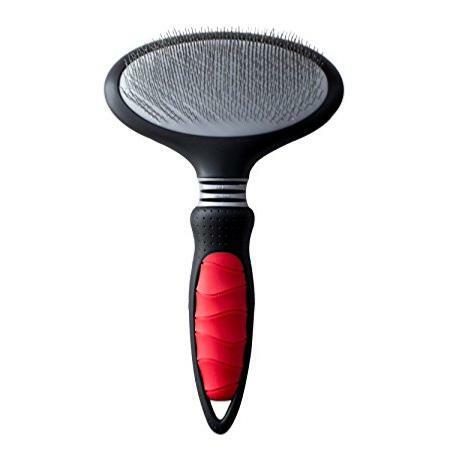 The Hard Pin Slicker Brush is an effective, ergonomic grooming tool which allows for gentle grooming of thick and dense coated breeds. 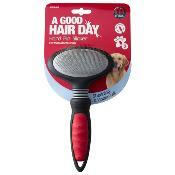 The shaped stainless steel pins gently massage the undercoat to remove loose hair, while penetrating deeply into the coat to remove matts and tangles. The pins are mounted on an air cushion to enhance grooming action and reduce any excess force when brushing, while the flexible head creates an easy grooming surface for both pets and owners. 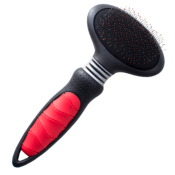 This brush can be used on all coat types: Wire, Long, Curly and Double.